Sing along: The Llama Song! Have YOU ever seen a llama kiss a llama on the llama? Please don’t curse me when you can’t get this song out of your head, and please don’t throw yourself off the balcony when the bizarre imagery from the video invades your sweet slumber. Be forewarned: I can’t seem to make the video stop once it starts. Enjoy! How in the heck do you use a duck press? I saw a funny tool at a kitchen store the other day. 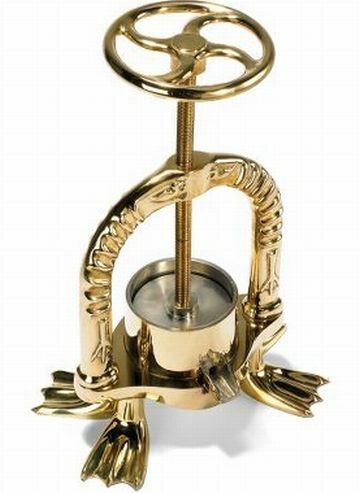 It was marked “Duck Press,” and I assumed it was some kind of old-fashioned tool used to squeeze out more fat from duck skin or something like that. Reasonable assumption, I thought. In an effort to find the “real” answer (or maybe in part to congratulate myself for having such finely-honed deductive powers!) I did some research, and found I was grossly (emphasis on the ‘gross’ part) mistaken.